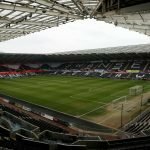 Graham Potter named a surprising line-up and formation away at Stoke City on Tuesday night – a side that nobody would have seen coming prior to kick-off. It’s not the first time that the Swansea boss has kept us all guessing with his line-ups as we’ve been left wondering before who’s playing where. At Stoke, we saw the likes of Naughton, Byers, Routledge and Dan James all playing out of position in what looked like a 4-4-2 with the latter two mentioned playing alongside each other up top. 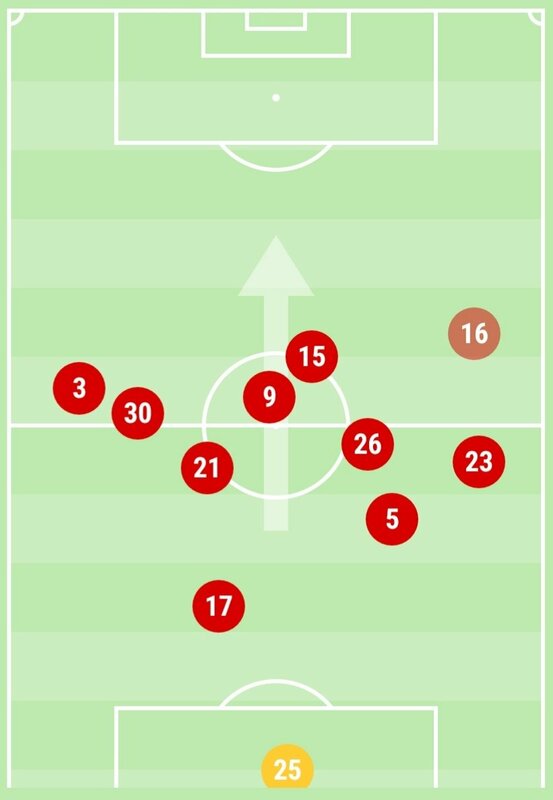 Below shows the average team shape of both sides in the first-half with Stoke City on the left and the Swans on the right. Stoke’s shows good balance across the pitch with a trio in the centre operating close together with the full-back and winger getting forward down either flank. Unlike the Swans where their main striker – McBurnie drops deeper into midfield to get involved in the play, Stoke’s striker Afobe stays further upfield which demonstrates that they were direct in getting the ball to their front-man with balls being played over the top. 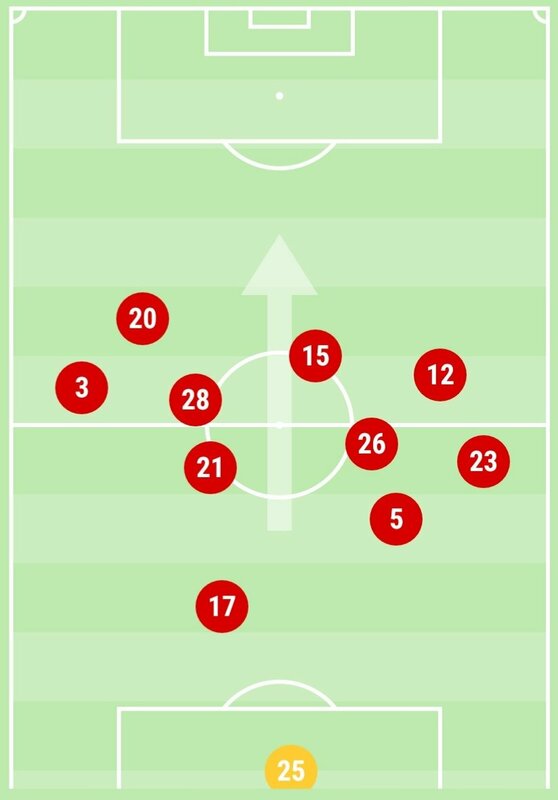 Swansea’s first-half team shape (below right) shows a greater emphasis on the left in terms of attack. This isn’t a surprise because we were far more active down that side with Byers, Olsson and James combining well early on. Martin Olsson (3) pushed further forward than his opposite number Connor Roberts (23). The Swans sat in a 4-4-2 shape out of possession with Dan James and Routledge leading the higher than usual press but at tiems it looked more like a 4-3-3 when they had the ball with Matt Grimes (21) playing deeper than Kyle Naughton (26) and George Byers (28). However, Dyer didn’t get forward enough for it to be a true front 3. Routledge played through the middle with James shifting across to the left. 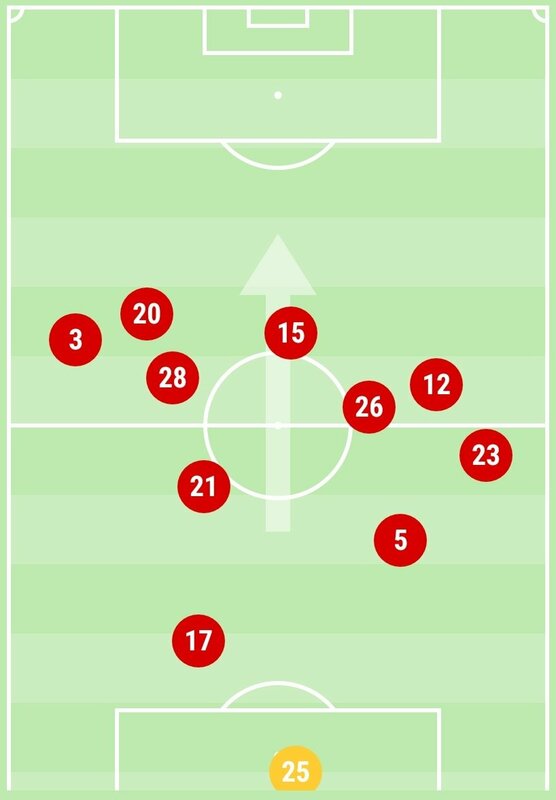 The side-by-side comparison shows Swansea City’s overall team shape for the entire game – with substitutes shown on the map on the right. As Rodon has done in previous games, Carter-Vickers (17) played in a deeper position compared to his defensive partner Mike van der Hoorn. The changes saw a like-for-like swap with Dhanda replacing Byers on the left. On the right, Asoro played in place of Dyer and McBurnie coming on for Byers saw Routledge get some much-needed support through the middle. Stoke City simply made one change, adding more support up front with Afobe as Berahino came on with about 15 minutes to play as they looked to guarantee the three points.